Call us today on 01926 424 000 for a free quote! Thank you for your interest. We welcome your enquiry and we are happy to undertake all local electrical work from small installations to large projects in South Warwickshire, covering Royal Leamington Spa, Warwick, Kenilworth, Coventry, Stratford Upon Avon, and the surrounding areas of the West Midlands. Does your house need rewiring? We assess and test your existing wiring system, and work with you to design an electrical installation for your needs. Many older homes were never designed to meet the needs of our ever increasing demand for more electrical power. 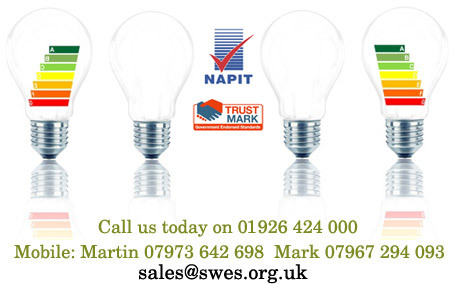 Our work is to the latest wiring and building regulations and is NAPIT (the National Association of Professional Inspectors and Testers) certified. If you have any concerns your that your wiring system is either inadequate or old then please contact us. Defective wiring can cause house fires. We install all lighting, whether it be for the home, your garden, your driveway or security lighting using mains voltage, low voltage or even energy saving lights that use only a fraction of the energy of a tradition light fitting. Lighting can transform your home. South Warwickshire Electrical Services specialise in the installation of recessed downlighting systems. Mains or low voltage lights are available in a wide variety of styles for different situations, and fire rated downlights are available to comply with the latest building regulations. Bathroom and shower downlights are also available for areas at risk of moisture and condensation. We can enhance your kitchen and provide good lighting for worktops with a range of downlighters. Planning a bathroom update? We can enhance your bathroom with a range of ceiling lights, wall lights, and mirror lights. Take advantage of the unused space in your home with a professional loft lighting installation. Whether it's a simple bulb and switch so that you can use your loft for storage, a fluorescent light to illuminate the train set or scalextric, or a professional and attractive lighting system so that you can gain an extra room, we have a solution that will fit your needs. We install extra sockets and power outlets within the home, often with minimal disruption, whilst still ensuring your wiring circuits are safe and not overloaded. We can also install power to your shed or garage for lighting or your electrical appliances. Is your fuse box old and out of date? If you still have traditional heat sensitive fuse wire within your consumer unit, it would be wise to have it checked by a professional. Consumer units should be fitted with miniature circuit breakers and an earth leakage protection device, which is far more sensitive, and hence safer than old style fuses. We check all electrical circuits and advise upon the safest most cost effective solution. Give your family the safety they deserve. Every year the Fire Service is called to 600,000 fires which result in 800 deaths and over 17,000 injuries, many of which could have been prevented if people had a smoke alarm installed. Make sure your property has mains powered smoke & gas alarms to detect carbon monoxide gas, which is an odourless gas that can kill and is caused by poorly maintained gas fittings. We fit the latest electric showers, providing all services, from the electrics to plumbing and even tiling to give your bathroom that wow factor. Please note, with the introduction of 17th Edition IEEE regulations, electric showers can only be installed by a qualified electrician. From the latest full electric central heating to modern storage heaters, and even underfloor heating systems, we can design and install anything to meet your requirements. Heating your home with electric storage heaters is less expensive, using electricity as the energy used is consumed during off peak hours at a cheaper rate. If it's broken we can fix it. Inevitably electrical problems do occur within the home at sometime, but our qualified electricians can quickly find the cause, isolate the problem to prevent any danger, and find the best solution for you at an affordable price. Testing and inspection work on your premises, insurance work and landlord certificates, we can supply you with all the relevant paperwork to ensure you're up to date with all building and electrical regulations. Our work is to the latest wiring and building regulations and is NAPIT (the National Association of Professional Inspectors and Testers) certified. Give your tenants complete satisfaction, make sure you have the correct certificates.